It's as easy to use as it is beautiful. Over the years, it brought me a healthy dose of laughter, inspiration, and discovery. There's no "native" way to sell on Tumblr. How can I make an online store on Tumblr? Well, I've got an answer for you. 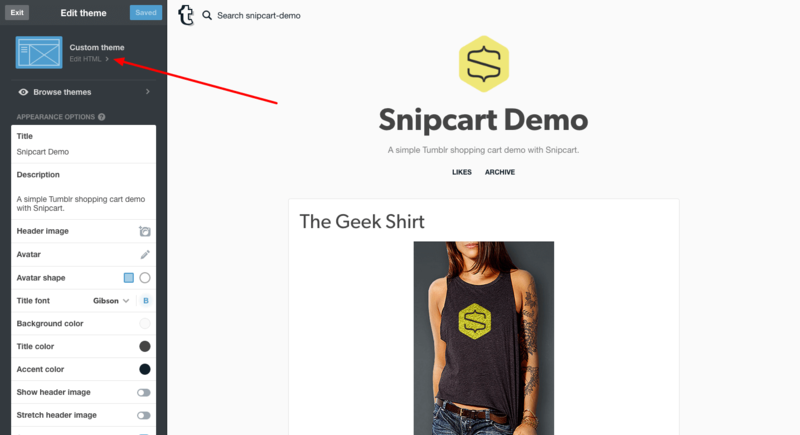 It's called Snipcart, and it'll allow you to add a shopping cart to Tumblr in two minutes. No, I'm not kidding. 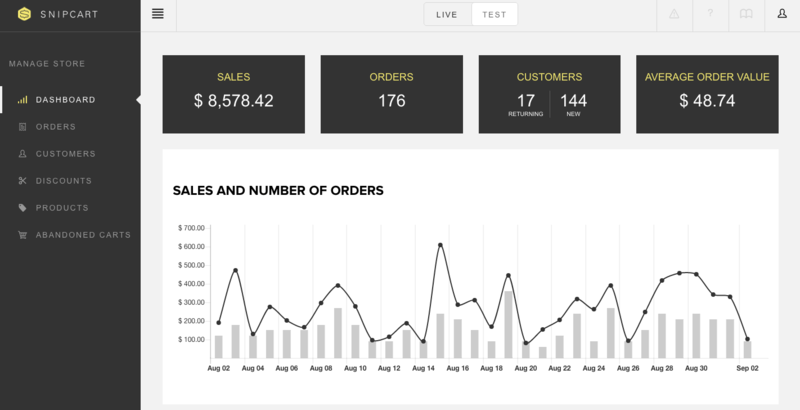 Yes, we brag about the rapidity of our shopping cart integration all the time. So today, I'm going to prove how quick enabling e-commerce on Tumblr really is with Snipcart. We’ll start by adding the magical required JS and CSS files—just two short lines of code—in your site's tag. 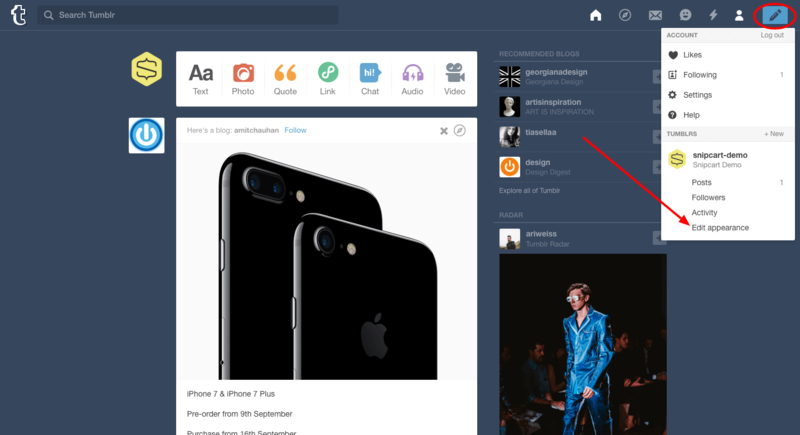 This will literally inject the shopping cart inside your Tumblr site! 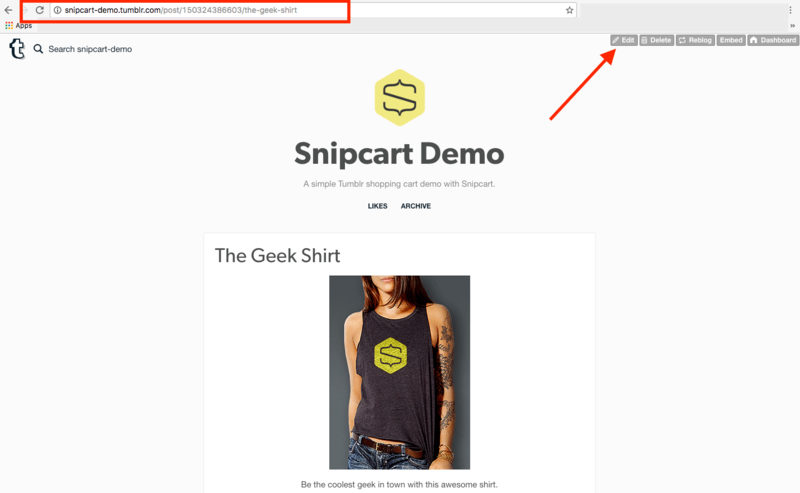 You can find the snippet under Account > API Keys in your Snipcart merchant dashboard. Copy it, and head to Tumblr. 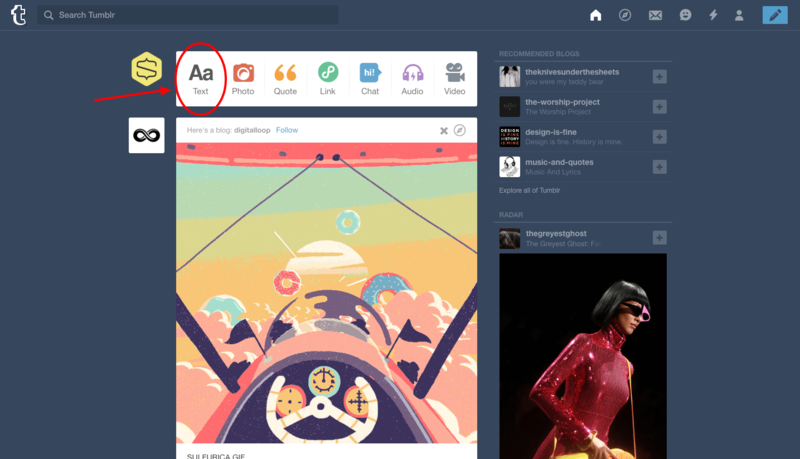 Once you're logged into your Tumblr dashboard, head to Account > Tumblrs > Edit appearance. Now hit the Edit theme button next to the Website Theme option. All sorts of colourful lines of code will pop up. Don't worry; we don't need to read or change any of that! All you have to do is find the closing tag of your site's head. Protip: hit CTRL + F "</head>" to get there real quick. Done? Hit both Update preview, then SAVE. We're already halfway through, folks! Quit your editor and go back to your dashboard. We've added the shopping cart; now it's time to create some products to sell on your Tumblr blog. We'll use the Text post to do just that. Now for the slightly trickier part. 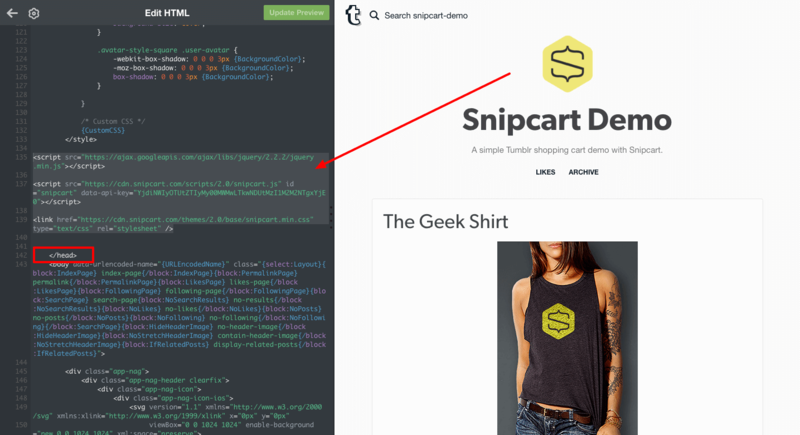 Snipcart products are created using dead-simple HTML attributes. Which basically means you can transform any link, image, or button on your blog into a buyable product. 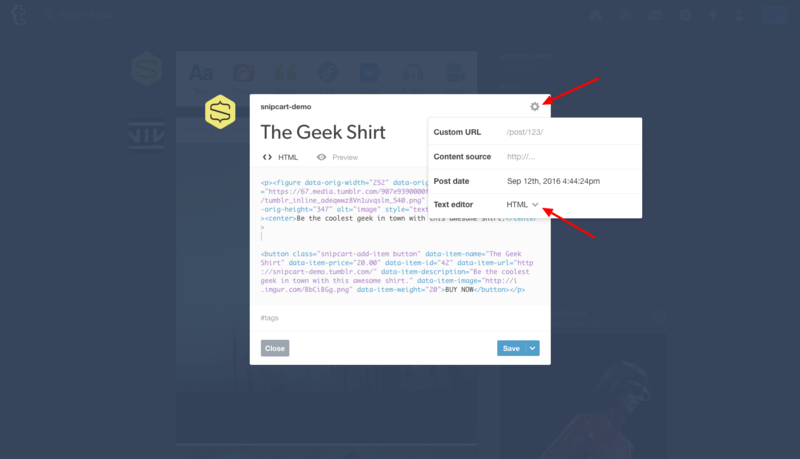 For this tutorial, we'll add a product on a "buy button" in a Tumblr text post. Let's say you want to sell a geek t-shirt on your blog. data-item-description="Be the coolest geek in town with this awesome shirt." The data-item attributes you're seeing are merely the details Snipcart need to create your product so you can sell it in your shopping cart. Keep the snipcart-add-item class at all times. One of the most important Snipcart product attributes is the URL. You'll need to save your post first in order to get its full URL. Once you do, simply edit your post and copy paste its URL in the data-item-url attribute. The text you enter just before </button> is the call-to-action your button will display on your blog. I also added an image to my Text post + a little product description. Doing the same will make your product post look sexier! And now, ladies & gentlemen, let's have a look! See the demo Tumblr site for this tutorial. There you have it, a full shopping cart on a Tumblr site, ready for e-commerce! And if you want to create a truly custom e-commerce experience, you should definitely look into customizing your Tumblr shopping cart. Now, this will require some more serious coding. So depending on your development skills, you might want to get some help from a developer, or try learning some cool code basics first! 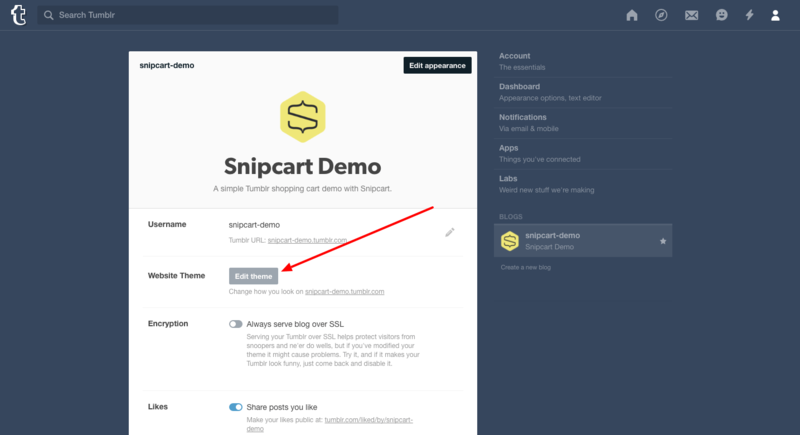 Adding a shopping cart and buy buttons to Tumblr with Snipcart was a fast and smooth experience. But we could've easily embedded our products inside simple text links (<a href>) or images (<img>) too!